When going through your pictures at the end of a day of chasing you reject pictures because they only have one tornado in them… the only fitting description for that day is Epic. 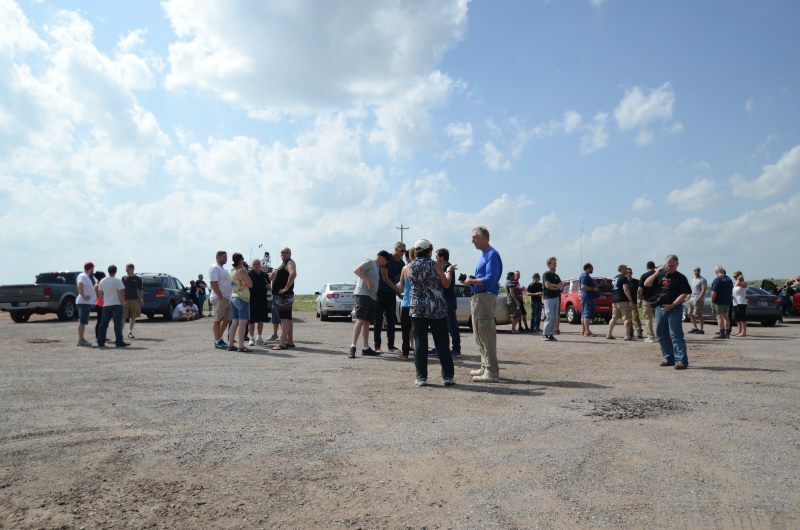 We headed north out of Childress in Texas into Oklahoma and played the waiting game, first at a gas station in Shattuck and then at a crossing of two roads near Laverne. 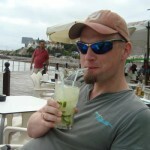 A huge group of chasers converged here, including fellow Dutch chasers Peter and Wilfred. So many people to talk to, but we kept an eye on the storms as well. The wait seemed to last forever in a 33 degree heat without shadows, but a storm did fire in the afternoon and we headed towards it. 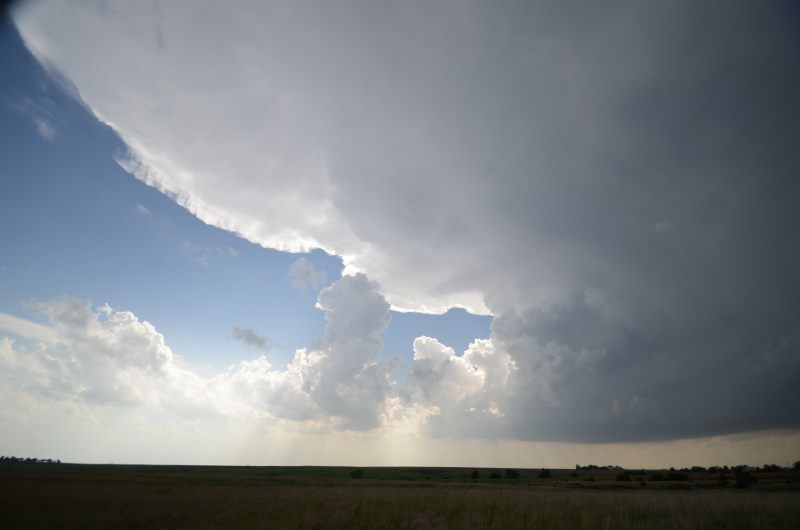 When we approached it in Kansas a classic supercell appeared, with a crisp anvil and updraft and rain free base. There was no lowering yet, the storm got a tornado warning because some one reported a funnel cloud but no tornado seemed imminent. We tracked the cell a bit north and made a stop somewhere along the road. By then the storm did have a wallcloud. This is my fourth chase and from the previous experiences my feeling was that this storm was going to produce a tornado for sure. This didn’t look anything like the storms we had chased for hours and hours into Memphis in 2011 or the ones in Texas in 2014… this looked like a matter of time. Yet the storm moved away so we had to relocate. As we got out of the van at the next stop I spotted some dust on the ground near one of the lowerings… technically a tornado, but after all the half and half pictures of the last week that was not enough. The storm teased us, dropping several well defined funnels, but condensation never reached the ground. When it did… it was the start of an amazing chase. After a few brief ropes the tornado turned into a big trunk. We were able to track it for a bit before it lost definition in a rain curtain, at the same time a new rope tornado appeared. Not long after that yet another rope tornado formed which did grow into another solid trunk tornado that even got a horizontal vortex for a bit, the first time I have ever seen this. While that one slowly moved into the rain two more rope tornadoes appeared. These might have been sub vortices of a larger tornado. The region in which this occurred eventually evolved into a wedge. Even though the wedge was never fully condensated the rotation was clearly evident on the ground. 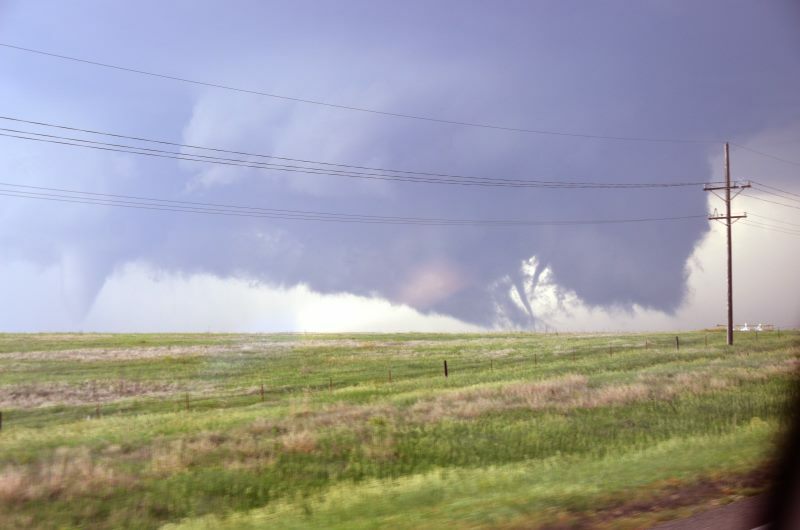 The wedge had several subvortices and at one point one of them became dominant as it moved very close to Dodge City triggering a Tornado Emergency. As far as we know by now only two people were injured, yet several buildings were destroyed. 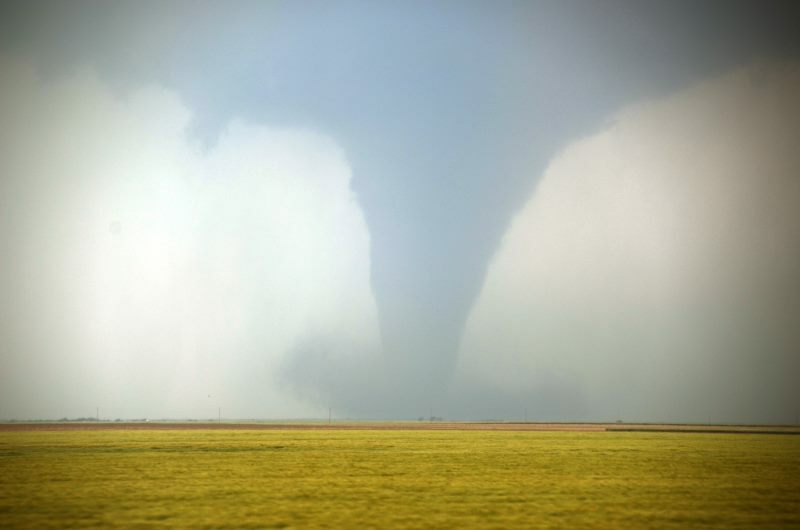 The storm did produce several more funnels and tornadoes and then weakened. We then tried to reposition but could not get to the next storm in time before daylight was lost. A double rainbow with mamatus clouds accompanied the sunset. We are staying the night in Hutchinson, Kansas after a great meal at Applebee’s. At the moment a few thunderstorms rage on outside, so it might be a bit hard to get up in time tomorrow for another chase.